Now that our EMIN buses have finally come back home in Belgium and the crew has left its dear vehicles full of signatures, let’s take the opportunity to thank you all from the bottom of our hearts for this wonderful journey: the many volunteers, the international crew on the bus and the volunteers who welcomed us. Especially the people from the national teams who were responsible for welcoming the bus in their country, presenting us interesting programmes of awareness raising with the public, contacts with public authorities, the media, partners in the networks, they have done a marvellous job! Visiting projects, talking to people, advocating for decent minimum income schemes on the streets and market squares was only possible thanks to their efforts. 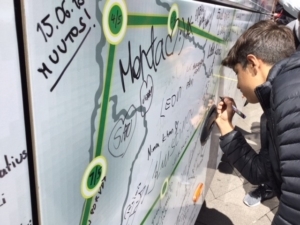 Thanks also to public authorities, civil society organisations, trade unions, academics who supported us, to journalists who reported on our journey, to the many people who shared their personal stories with us and signed the bus. The bus journey gave us an excellent chance to campaign for decent minimum income schemes. In the discussions we could also address broader issues such as the importance of good social protection systems, job opportunities for vulnerable people, the consequences of the crisis on people’s life chances, the need for fair taxation systems etc. We will not pretend that the bus tour has turned the existing minimum income schemes in countries into models for a perfect world. But the bus journey certainly was a success! The stories in the countries we have been to are certainly all very different. But most of these stories were encouraging: be it in terms of their dynamics to push for improvements in Minimum Income Schemes, or, in countries where the political environment is not supportive, in terms of the development of a strong CSO movement with a lot of creativity and innovative ways of campaigning. 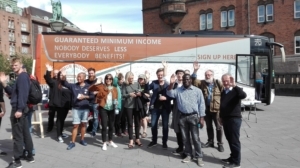 We, the crew on the bus, felt energized by the many contacts we had, even in those countries where working with the official authorities to improve minimum income schemes proves to be particularly difficult. 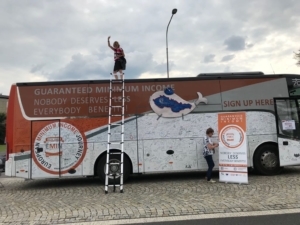 At the same time the presence of the bus in the countries has brought fresh energy to EMIN teams to continue to engage to improve people’s lives. In many cases the bus has made it possible to strengthen partnerships in the fight against poverty and social exclusion, with new organisations that were not involved yet. It allowed teams to liaise with public authorities who were triggered by the presence of the bus as part of a Europe-wide campaign. And that it gave EMIN teams the feeling of belonging to a European-wide family that is striving to achieve the same objective. The fact that the bus toured in 32 countries had a strong effect in all countries. We have experienced that the situation in the countries we visited is very different and that there is no one best way to deal with advocacy, convince public opinion, parliaments and governments. But activities and experiences in countries often served as inspiration for other teams. In some cases, it gave birth to cross-national cooperation between teams who exchanged their experiences. The bus tour also strengthened our conviction that our common aim can only be reached when we fight for social rights at all levels, local, national and European. The bus journey has enabled us to bring many stories back home, that will be used in our communication on the importance of decent minimum income schemes for all. They will also be used for our advocacy with the European institutions. And of course, they will colour our final conference of the EMIN project later this year. So thanks again to all people involved in this marvellous journey on the bus! A special thanks should go to the father of the project, Fintan Farrell: without him this journey would never even have been invented or started. Most of us declared him crazy to even think of such an ambitious bus adventure. But he proved us all very wrong. Thanks Fintan!!! Thanks also to our fantastic drivers, Philippe and Marcel, who did so much more than driving us safely through all these countries. We hope to see many of you at the occasion of our final conference. And don’t forget: we still can use support in our call for decent minimum income schemes in all countries in Europe. So please, sign and circulate our petition!